Joe’s Garage is the title track off of the album “Joe’s Garage Act 1” that was soon followed up by “Joe’s Garage Act II and III“. 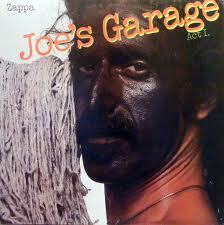 Both were produced by Frank Zappa and put out on Frank’s own “Zappa Records” in 1979. This record could be the first album put out by Frank that got some positive critical acclaim from the media types. Yes there were many critics that put the record down right after it came out but over time they have come to acknowledge the brilliance and pure talent that was involved in the creation and sound of the record. Zappa’s music style did not fit into any main stream style, starting with his early days as part of the Mothers of Invention to the day he died as a solo artist in 1993. When you read from the Wikipedia page about him, even the many writers who have contributed to the page have a lot of trouble trying to fit him into a specific music category. For those of you that are new to Frank Zappa, his writing style along with how his back up musicians played their instruments behind him was off the wall, different and truly on a world all it’s own. Songs like Montana, were Frank wants to move on up to Montana to grow dental floss, or the four song set off of Apostrophe that tells the story of Nanook the Eskimo. The story follows a man that wants to be an Eskimo named Nanook and his Mom tells him “Don’t Eat the Yellow Snow” then off to the fur trapper “Nanook Rubs It” where the trapper is whacking his favorite baby seal and Nanook smears the “deadly yellow crystals into his eyes” and the fur trapper remembers that if a Eskimo ever smears snow in your eyes that you need to go off and eat pancakes at “St. Alfonzo’s Pancake Breakfast” . The song that finishes the set is “Father O’Blivion”. Most of his music shows how passionate he was against censorship and how he strongly believed in our first amendment rights. Joe’s Garage starts off with a casual music beat as we are told about how small Joe’s garage was, the instruments they had including the whammy bar on the guitar and then the music steps up to a 60’s type beat as Frank tells us how they used to play the same old song day and night. There is a little change of style for a few seconds as the saxophone player shows how easy the song was to play, then the beat starts to get this groove style that begins to get your feet moving. We start to hear the story about how they were getting better at playing the song and the chicks starting to come around. To keep up the sound of the song they go into a little beach guitar sound made famous in the early 60’s while all along keeping that smooth sound that is so prominent through out the song. At some point the music picks up a little steam as it talks about the trials of bad record contracts and breaking up. After the neighbor lady says “Don’t you boys know any good songs” the song picks up more speed through the rest of the song. The band gets back together after many different music styles come and go like disco, punk and new wave. Joe’s Garage the song is really years ahead of it’s time as far as the lyrics go since starting around 2000 we saw and still see many old rock bands getting back together to play that same old song. This entry was posted in Classic Rock, Forgotten Rock Classics, Forgotten Songs, Frank Zappa, Joe's Garage, Music, Rock Band and tagged Classic Rock, CS5711, Forgotten Rock Classics, Forgotten Songs, Frank Zappa, Joe's Garage, Music, Record, Rock Music, Song. Bookmark the permalink. Funny, I was going to mention FZ on the your Eno piece. Far from the mainsteam but so good. All the great music that came out of Frank and the musicians he used over the years. His sense of humor was a bonus. A piece on ‘Joe’s Garage’ is probably a first. Again, good choice. CB digs the song and the album it comes from. Thanks CB! To me what made Frank so great solo or with “The Mothers” was that he didn’t follow the main stream and his lyrics and music were so original. Who else would write a song about growing dental floss in “Montana” but good old Zappa.